Aviator sunglasses are truly an iconic retro fashion statement that never goes out-of-style. 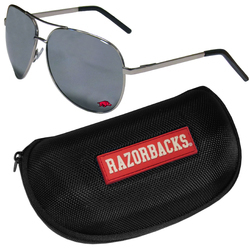 Our Arkansas Razorbacks aviator sunglasses pair this classic look with your love of the game. The iridium coated lenses reduce glare while driving, boating, golfing and their 100% UVA/UVB rating provides you with the maximum UV protection for all your outdoor activities. A millennial favorite, these affordable designer frames are the perfect eyewear accessory for a sports fan that is looking for high-quality at an affordable price. The durable, flex hinged frames are tough enough for hiking and camping or if you prefer sun bathing by the pool or on the beach these shades will really stand the test of time. The sunglasses come with a hard shell zippered case which has a large team logo on the lid that will make even the most die-hard fan proud!